The Alvin Plumbing Fixtures Drawing Template works great for quickly drawing to scale bath fixtures, shower stalls, lavatories, sinks and more. Use this template for residential or commercial drawings. 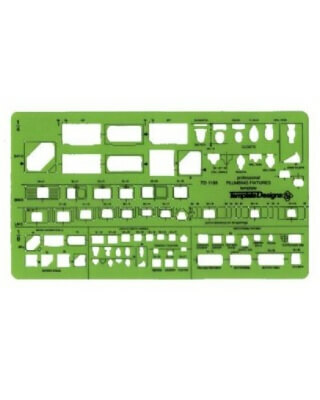 This template compares to Staedtler Mars, Pickett, or RapidDesign. Contains baths, shower stalls, lavatories, and sinks. Scales: ¼" and 1/8" = 1’. Template Size: 51/8" x 9¾" x .030".